This entry was posted in Uncategorized and tagged African Americans, baseball, Jackie Robinson, movies, racism, sports by Matthew N. Lyons. Bookmark the permalink. Incredibly enough, my mother used to take the subway to Ebbet’s field and I, too, grew up with stories about the Brooklyn Dodgers and Jackie Robinson (maybe we’re related?). And her grandchildren have heard endlessly about the Brooklyn Dodgers and how she several years ago, very reluctantly, became a Mets fan several years ago. Imagine that! Hi, Susi! 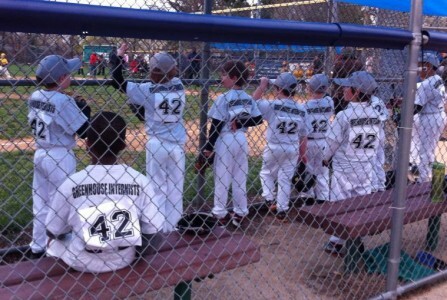 Speaking of the Mets, one nice touch in “42” is seeing a young boy named Ed be inspired by Jackie Robinson early in the film, and then at the end of the film we learn that it’s Ed Charles, who went on to play for the 1969 “Miracle” Mets. I guess that’s probably a standard bio-pic device, but as a sometime Met fan myself, I enjoyed it.